The ideal method of cooking ribs is in a smoker, but if you don't have this particular piece of equipment, you can use your gas grill. However, the number one mistake people make when trying to grill ribs is using too much heat. Barbecue ribs should not be cooked quickly over a high direct heat source; instead, the ribs need to be cooked "low and slow" meaning over a low heat for a long period of time. There are several ways you can slow-cook pork ribs on a gas grill, but the two things that are consistent are to have patience and a watchful eye. Other than that, you need to set up the cooking area, set aside a lot of time, maintain the temperature, and season properly. For many of us, the grill is great for cooking foods hot and fast, allowing us to get dinner on the table in a jiffy. But the grill can also be used to cook foods slowly at a lower temperature—we just need to set up the grill a certain way. This is called indirect grilling, meaning that you have a fire on one side of the grill and the food on the other. To make a grill work as a smoker, you will also need to use two pans, one to catch the drippings and one filled with water; this added moisture will keep the ribs from drying out. The drippings pan is set below the ribs and the water pan goes above the fire. Of course, there are variations to this basic layout and you probably need to do a little experimenting to determine what is going to work best for you and your grill. A couple of variations include using wood chips soaked in water that are added to the charcoal fire if you are using a charcoal grill, or placed in the smoker box if you are using a gas grill. This will add a good smoky flavor to your barbecue ribs, giving them an authentic taste. No matter if you use wood chips or not when placing the rack on the grill make sure the ribs do not overlap the fire or they will burn and dry out. 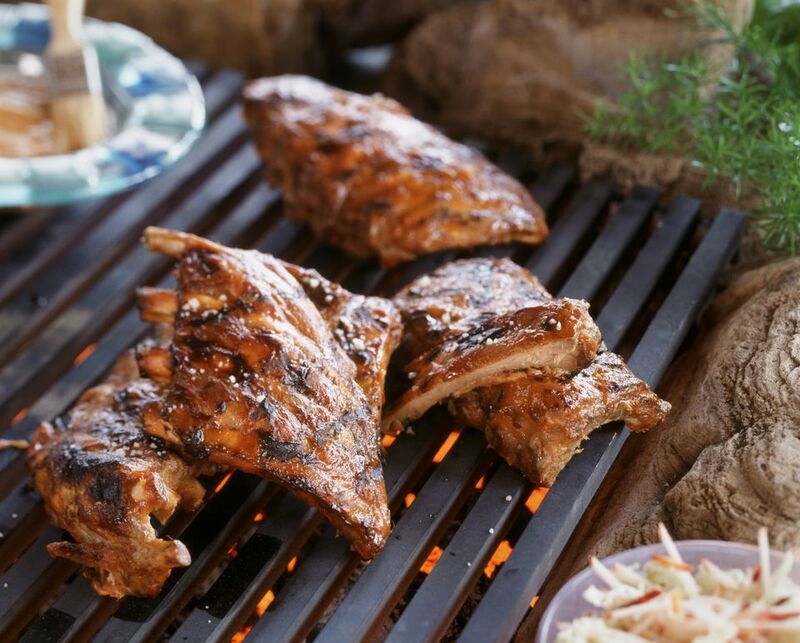 When you cook ribs in a smoker, they sit for a long period of time at a low temperature. To mimic this process, you will need to set the grill to a low temperature and cook your ribs for several hours. You want the inside of your grill to hold a temperature around 225 F/110 C for the entire cooking time, which means you need to check on the grill to make sure the temperature is maintained. While you're checking the temp, take a look at the ribs; it is important to keep a close eye on your ribs because once the surface of the meat starts to burn there's no going back. If you are using wood chips, you will probably have to add more wood every hour. This is particularly important for the first 2 hours. Your ribs will be done when they become tender and the meat is loose around the bones, which can be 4 to 5 hours. To speed up the process or to increase the tenderness of the ribs, you can pre-cook the rack. Ribs cooked on a barbecue smoker at a low temperature for several hours will be very tender. However, ribs cooked on a grill, especially a gas grill, will not be as tender, even when cooked indirectly. You can precook by either boiling the ribs for about 30 minutes or by placing them in a slow cooker. Once you are ready to grill, season the ribs and cook them indirectly until done. The disadvantage of this is that you can literally boil out the flavor of the meat and the ribs will not absorb the flavor of the smoke as well. When it comes to seasoning ribs, you want to be very conservative; good ribs have a great flavor all on their own and don't need a lot of enhancement. It is also important to avoid adding barbecue sauce to ribs early in the process. Most barbecue sauces, whether store-bought or homemade, contain some kind of sugar (tomatoes contain sugar). This can cause your barbecue ribs to burn, even when cooked indirectly. Try using a good rub before you grill, and if you like, a barbecue sauce after the grilling is done. If you are adding a sauce, try using a mop. A mop is a thin barbecue sauce (mainly vinegar or water) that you brush on during grilling to help maintain moisture and to add flavor. Sometimes you will hear it referred to as a baste. You can also fill a spray bottle with a thin barbecue sauce, thin meaning it is practically water. Try a mixture of paprika, water, and a few other seasonings. By spraying the ribs with this mixture during grilling you will add moisture, reduce burning, and add flavor to your barbecue ribs.